The 2017 Poker TDA rules are available in both Word docx and PDF files. Both are also available in a full “Longform” version and a condensed “Short Form” version. The Longform contains rules, recommended procedures, and a large illustration addendum. Short Form contains rules only in a landscape layout that can be printed both sides for “pocket size” convenience. For foreign language translations, please click here. 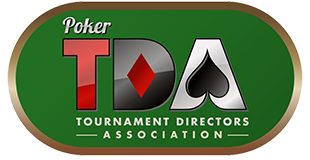 If you have a question about the interpretation or application of a TDA Tournament Rule, or if you would like to suggest a new rule or amendment, please consider participating in the Poker TDA Discussion Forum. TDA Recommended Procedures are included in all longform documents above and may also be found on the Poker TDA Forum. TDA Recommended Procedures are intended as policy suggestions and general guidelines that can reduce errors and enhance tournament management. They also may apply to situations that have too many variations to address with one universal rule. The fairest ruling in these cases may require use of multiple rules, evaluation of all circumstances, and reliance on Rule 1 as a primary guide. PDF Format, Handout size: 2011 TDA Rules Version 1.0 with red changes from 2009.